The Car Bottom Furnaces design offers a great advantage which is the ability to handle large / heavy loads, as the product is loaded onto the car(s) when located outside the actual furnace area; this eliminates the damage to the furnace interiors during loading and unloading. Temperatures up to 2460 F (1350 C). Most advanced heat recovery system saving FROM 10 to 70% energy vs cold air system. Heavy duty car refractory designs with high Thermal shock resistance capacity. Tight seal designs are available allowing excellent pressure control to optimize the use of regenerative burners. Heavy duty car refractory designs with high Thermal shock resístanse capacity. Gas fired, indirect gas fired and electric heating systems available. Recirculating ventilation systems designed to provide large volume and high velocity air flow through the work zone to insure uniformity and efficient heat transfer to the load. Reversing air flow system designs to improve uniform heating in large products. Energy efficient and low maintenance insulation systems with ceramic fiber modules and telescopic panels depending of the application. Different door designs configurations depending of product, facility and layout requirements. Non burner option designs available with the use of external energy source using hot gases from existing forge or aluminum melting furnaces. Control system capability to maintain stable operation from the energy supply furnace so it can be used according to normal parameters. Nutec Bickley provides heavy duty Car bottom homogenizing furnace systems with the best technology for aluminum logs and ingots in order to provide workability and to improve surface appearance of extruded products. Logs can be treated in diameters from 6” to 14” and in full lengths or in sections. Heavy duty car steel frame and refractory construction. Reversing air flow system designs to improve uniform heating. Dynamic breaking system used in circulation fans in order to improve the stop time of the fans. Energy efficient and low maintenance insulation systems with ceramic fiber modules. High convection Cooling chamber design in order to achieve the required cooling rates and log properties. Cooling chamber designs with air or combination of air / water mist. 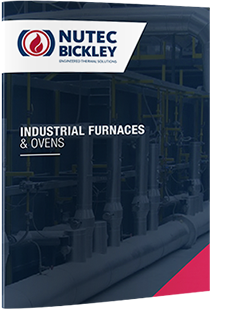 Nutec Bickley provides heavy duty car bottom furnaces line for Stress relieve (PWHT) of large steel plate weldments as rails tanks, vessels, large boiler parts, heat exchanger parts, land movers machinery parts, etc. Heavy duty stable steel frame construction. Low maintenance fiber lined sections using the large modules system to reduce the amount of joints. Low mass car bottoms design to reduce fuel consumption, reducing car heat storage. Pulse firing combustion system to allow an excellent temperature uniformity. Post weld heat treatment according with AAR Manual of standards and recommended practices specifications for tank cars.